Zeerk | Who we are? Zeerk is a micro jobs site where freelancers specializing in various different fields come together and present their skills to be used and employed by those who need them. These services are priced reasonably by the service providers and jobs vary from costing as low as $3 to as high as $200 for a single job depending on the expertise, job description and value of the job provided. The general categories of jobs on Zeerk include lifestyle, audio and music jobs, business jobs, writing and translation jobs, animation and video jobs, design and graphics jobs, tech and programming jobs and SEO and online marketing jobs. Within these broad categories, several different jobs are posted regularly on Zeerk and you too can present your skill to the world for consideration and praise. The initial step to start working with the site is to sign up and create an account after which you will be allowed to choose categories and post your ad on the site stating which services you can offer and at what price. It is necessary to quote a reasonable and fair price for your quality service that truly matches its value and which will render buyers of your service to agree. There are at least two to three skills that every individual might be able to offer to potential buyers. All you are required to do is to post your skills and wait for the buyers to contact you before delivering the job. Once this is done the buyer will reward you not only financially but will also leave you feedback that will explain his/her experience of working with you along with the quality of your work. Positive feedback of course increases your chances of being chosen again as it is a recommendation from your previous employer. The working method on Zeerk is very simple. Service providers can sell their skills and services at Zeerk for free, while buyers interested in hiring any of them for their services will first need to search the entire job list for any freelancer who fits his/her criteria of required services. Next he/she will register for a free account on Zeerk. Next the buyer will purchase the required service after agreeing on a price and once confirmation is sent the seller starts with the job. Once the job is completed the seller will deliver the job to the buyer, which he/she will collect and accept from the seller. As soon as the job is accepted, the payment for the hired service is paid which shows in the account of the seller in the form of virtual cash. This cash can be withdrawn from the account by the seller through different ways that include transferring the amount to a Paypal account. Every user of the site has a personal account that maintains the profile of the user and lists all his/her jobs. In this profile the user can at any time add new jobs or edit the existing ones. There is also a sales management panel available for the account of every user where active, closed and completed jobs are shown. Also the account shows all financial dealings done on the site along with the existing balance, the history of withdrawals and payments. Also in order to communicate with the different buyers, a private message area is arranged so that communication before and during a job can be conducted easily. Messages can be left for the buyer and the seller to check in case they are not available at a specific time. Post as many jobs as you like to enhance the chances of being hired by a potential buyer. However, one thing to keep under consideration is that Zeerk does not allow duplicating of jobs and so you are required to post your skills in a unique manner every time or else they are at risk of being wiped or deleted. 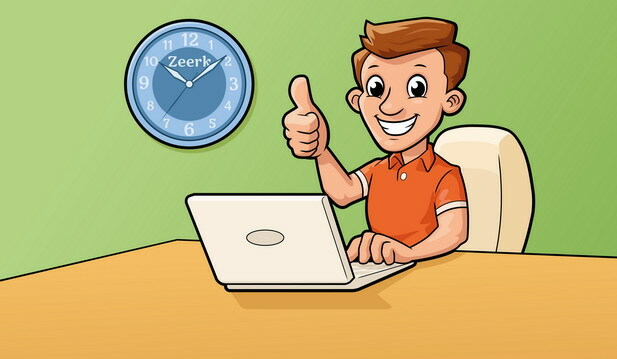 Zeerk is the perfect platform to introduce your skills to the world and the more you work for buyers the more your reputation builds on the site and new buyers prefer you over others to get their job done. So, what are you waiting for? 🙂 Let the world know your qualities so that you and the buyers can both benefit from it. Your buyers will earn affordable quality services while you earn hard cash right from the comfort of your home.